Nunavut is a part of Canada See Nunavut interactive map with the information about travelling to Nunavut. Want to travel to Nunavut on your own? Are you looking for more travel information about Nunavut? Wikipedia about Nunavut: Nunavut on our wiki pages. 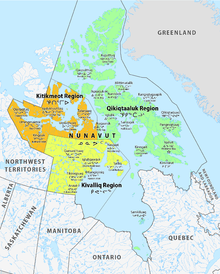 Nunavut (/nuːnəˌvuːt/ ( listen);French: [nynavy(t)]; Inuktitut syllabics ᓄᓇᕗᑦ [ˈnunavut]) is the newest, largest, and northernmost territory of Canada. 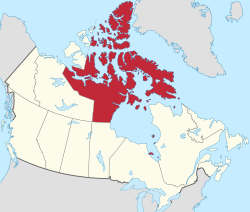 It was separated officially from the Northwest Territories on April 1, 1999, via the Nunavut Act and the Nunavut Land Claims Agreement Act, though the boundaries had been contemplatively drawn in 1993. The creation of Nunavut resulted in the first major change to Canada's political map since the incorporation of the province of Newfoundland in 1949. 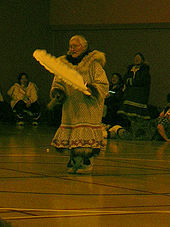 Nunavut also includes Ellesmere Island to the far north, as well as the eastern and southern portions of Victoria Island in the west and Akimiski Island in James Bay far to the southeast of the rest of the territory. It is Canada's only geo-political region that is not connected to the rest of North America by highway. Nunavut is the largest in area and the second-least populous of Canada's provinces and territories. One of the world's most remote, sparsely settled regions, it has a population of 35,944, mostly Inuit, spread over an area of just over 1,750,000 km (680,000 sq mi), or slightly smaller than Mexico. Nunavut is also home to the world's northernmost permanently inhabited place, Alert.Eureka, a weather station also on Ellesmere Island, has the lowest average annual temperature of any Canadian weather station. Nunavut covers 1,877,787 km (725,018 sq mi) of land and 160,935 km (62,137 sq mi) of water in Northern Canada. The territory includes part of the mainland, most of the Arctic Archipelago, and all of the islands in Hudson Bay, James Bay, and Ungava Bay, including the Belcher Islands, which belonged to the Northwest Territories. This makes it the fifth-largest subnational entity (or administrative division) in the world. If Nunavut were a country, it would rank 15th in area. Nunavut has land borders with the Northwest Territories on several islands as well as the mainland, Manitoba to the south of the Nunavut mainland, Saskatchewan to the southwest (at a single four-corner point), and a small land border with Newfoundland and Labrador on Killiniq Island, and with Ontario in two small locations in James Bay: the larger located west of Akimiski Island, and the smaller around the Albany River near Fafard Island. It also shares maritime borders with Greenland and the provinces of Quebec, Ontario, and Manitoba. Nunavut's highest point is Barbeau Peak (2,616 m (8,583 ft)) on Ellesmere Island. The population density is 0.019 persons/km (0.05 persons/sq mi), one of the lowest in the world. By comparison, Greenland has approximately the same area and nearly twice the population. In September 2008, researchers reported on the evaluation of existing and newly excavated archaeological remains, including yarn spun from a hare, rats, tally sticks, a carved wooden face mask that depicts Caucasian features, and possible architectural material. The materials were collected in five seasons of excavation at Cape Tanfield. Scholars determined that these provide evidence of European traders and possibly settlers on Baffin Island, not later than 1000 CE (and thus older than or contemporaneous with L'Anse aux Meadows). They seem to indicate prolonged contact, possibly up to 1450. The origin of the Old World contact is unclear; the article states: "Dating of some yarn and other artifacts, presumed to be left by Vikings on Baffin Island, have produced an age that predates the Vikings by several hundred years. So […] you have to consider the possibility that as remote as it may seem, these finds may represent evidence of contact with Europeans prior to the Vikings' arrival in Greenland." Cornwallis and Ellesmere Islands featured in the history of the Cold War in the 1950s. Concerned about the area's strategic geopolitical position, the federal government relocated Inuit from Nunavik (northern Quebec) to Resolute and Grise Fiord. In the unfamiliar and hostile conditions, they faced starvation but were forced to stay. Forty years later, the Royal Commission on Aboriginal Peoples issued a report titled The High Arctic Relocation: A Report on the 1953–55 Relocation. The government paid compensation to those affected and their descendants and on August 18, 2010 in Inukjuak, Nunavik, the Honourable John Duncan, PC, MP, previous Minister of Indian Affairs and Northern Development and Federal Interlocutor for Métis and Non-Status Indians apologized on behalf of the Government of Canada for the relocation of Inuit to the High Arctic. Glacially polished banded coloured marble on Baffin Island. Discussions on dividing the Northwest Territories along ethnic lines began in the 1950s, and legislation to do this was introduced in 1963. After its failure, a federal commission recommended against such a measure.In 1976, as part of the land claims negotiations between the Inuit Tapiriit Kanatami (then called the "Inuit Tapirisat of Canada") and the federal government, the parties discussed division of the Northwest Territories to provide a separate territory for the Inuit. On April 14, 1982, a plebiscite on division was held throughout the Northwest Territories. A majority of the residents voted in favour and the federal government gave a conditional agreement seven months later. Along with the Inuit Language (Inuktitut and Inuinnaqtun) sometimes called Inuktut,English and French are also official languages. The economy of Nunavut is Inuit and Territorial Government, mining, oil gas mineral exploration, arts crafts, hunting, fishing, whaling, tourism, transportation, education - Nunavut Arctic College, housing, military and research – new Canadian High Arctic Research Station CHARS in planning for Cambridge Bay and high north Alert Bay Station.Iqaluit hosts the annual Nunavut Mining Symposium every April, this is a tradeshow that showcases many economic activities on going in Nunavut. Agnico-Eagle Mines Ltd – Meadowbank Division. Meadowbank is an open pit gold mine with an estimated mine life 2010–2020 and employs 680 persons.The second recently opened mine in production is the Mary River Iron Ore mine operated by Baffinland Iron Mines. It is located close to Pond Inlet on North Baffin Island. They produce a high grade direct ship iron ore. The most recent mine to open is Doris North or the Hope Bay Mine operated by TMAC Resource Ltd. This new high grade gold mine is the first in a series of potential mines in gold occurrences all along the Hope Bay greenstone belt. Jordin John Kudluk Tootoo (Inuktitut syllabics: ᔪᐊᑕᓐ ᑐᑐ; born February 2, 1983 in Churchill, Manitoba, Canada) is a professional ice hockey player with the Chicago Blackhawks of the National Hockey League (NHL). Although born in Manitoba, Tootoo grew up in Rankin Inlet, where he was taught to skate and play hockey by his father, Barney. Nunavut has competed at the Arctic Winter Games and co-hosted the 2002 edition.